The Mantis is an battery-electric towing traverser from Curtiss-Wright Defense Solutions designed specifically for the deck and ground handling of military helicopters and fighter aircraft, especially the new-generation, low ground clearance aircraft such as the Lynx Mk 8 and also the Merlin, Harrier and Apache. 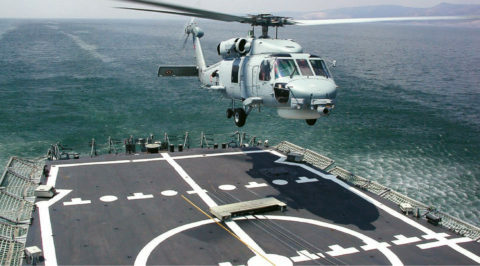 The Mantis provides the capability to manoeuvre helicopters and fi xed wing aircraft within the confi nes of a flight deck, shipboard hangar space or ground apron. The device has the ability to drive in four directions and spin on the spot around the tow point. Typically the Mantis cradles the nose wheel of warplanes on an aircraft carrier and thereby facilitates their multi-axis movement into position above and below deck. Offering fast, precise control from an umbilically connected operator chest pack, the Mantis fi ts wholly within the aircraft footprint to permit high-precision, high parking densities and make the best use of valuable parking space. 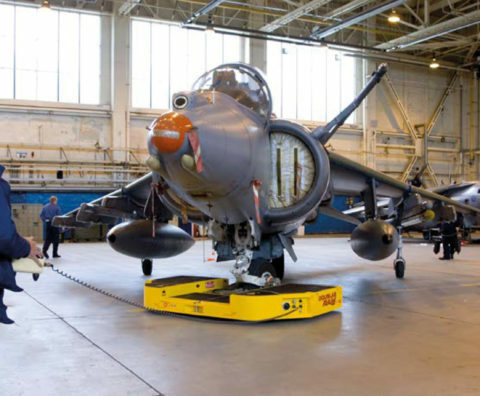 Since this solution addresses a defence requirement, during the design phase it was identifi ed that there would be a need to ensure levels of electromagnetic compatibility (EMC) in the power compartment of the Mantis in line with the applicable military standards. MPE was therefore asked to participate in pre-compliance testing work, undertaken at independent test laboratories to ensure such EMC compliance. The custom unit produced by MPE was a six-line, 7A 28V, DC filter based upon MPE’s world-leading range of military vehicle filters. To date MPE has manufactured and supplied a significant volume of these filters for the power compartment of the Mantis.